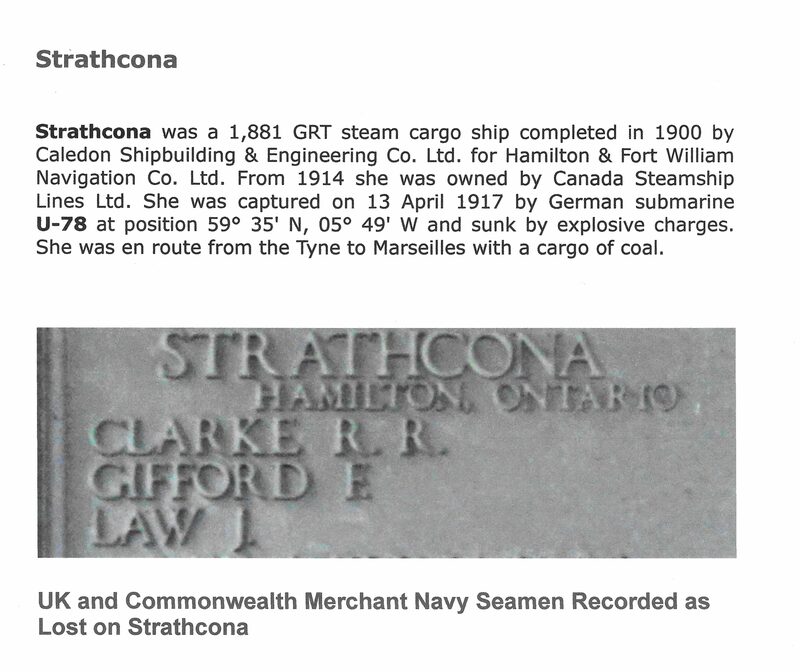 Strathcona was a 1,880 ton steam cargo ship. On 13 April 1917 she was en route from the Tyne to Marseilles with a cargo of coal. She was captured by German submarine U-78 off the Orkneys and sunk by explosive charges. Although she was registered in Hamilton, Ontario and her master was Canadian, she was crewed from the North-East of England. Three officers were taken prisoner and interned in Ruhleben Camp near Berlin – the master; the chief engineer from West Hartlepool; and the Third Engineer from South Shields. Among those killed in the attack, the 2nd Engineer and the young mess steward were from South Shields, and the first mate was from Middlesbrough. These three are recorded under their ship’s name on a panel of the Merchant Marine Memorial on Tower Hill, London. But that is not the whole story. On the Indian Merchant Marine Memorial in Mumbai five other seamen are recorded as having been lost with Strathcona. They were men from Yemen, then part of Britain’s Indian Empire, whose last port was reported to the Board of Trade as South Shields. Before the First World War only a small number of Yemeni Arab seamen lived in South Shields, having originally signed onto ships docking at Aden. This compared with over 1000 seamen from Germany, Scandinavia, the Low Countries and the Russian Empire, making up 30% of the seagoing workforce from the port. Many of these northern European countries became enemies or neutrals in the War while many British seamen were called into the armed forces. Many more Yemenis were drawn in to fill the gap and more boarding houses were opened to accommodate them. They worked mainly in the engine rooms as firemen and trimmers, stoking and shifting coal. A few were donkeymen, maintaining the smaller engines on deck. South Shields became the second largest centre of Arab seamen in the UK after Cardiff. Many of the seamen remained in South Shields after the war, at first in the increased number of boarding houses, between voyages, and then increasingly marrying local women and setting up home in the dock area. Said Saleh was a donkeyman on the SS Zillah, a 3,779 ton steam cargo ship. On 22 October 1917 she was en route from Archangel, in the allied Russian Empire, to the UK with a cargo of timber. She was sunk by a torpedo fired by German submarine U-46 approximately 25 nautical miles north-east of Kildin Island, in the Barents Sea off Murmansk. 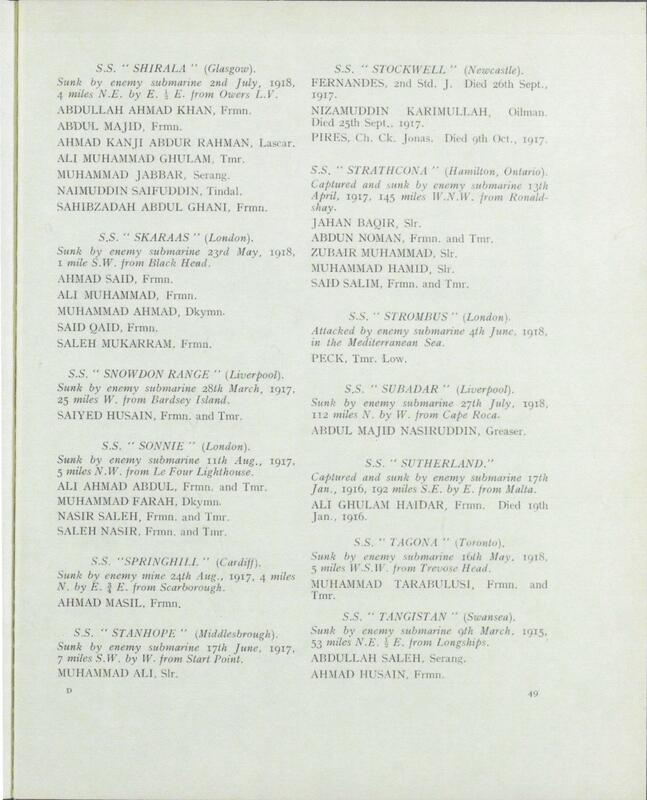 18 men were lost, of whom 8 were Arab seamen. One was Said Saleh, whose last address was a lodging house in Cardiff. A month later the owners replied to a letter from his wife in South Shields that the lifeboat he was in was still missing. He and his Arab shipmates are recorded on the Memorial in Mumbai. 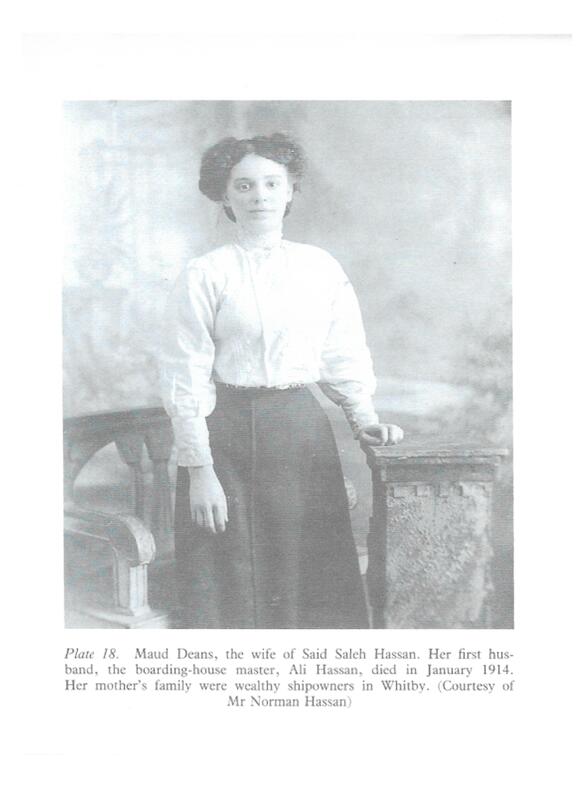 His wife, previously married to Ali Hassan, who owned a boarding house, was born Maud Deans in South Shields. She had given birth two months before to a son, Norman, who, in the 1990s, would be a great help to researchers with family documents and information. Salem Abuzed was a fireman on the Sunderland steamer SS May Scott which was one of a number of British ships caught in the Elbe by the outbreak of war in August 1914. The crew, including some from the North-East and two other Arabs, were interned in Ruhleben, near Berlin. This camp contained a wide cross-section of British society and citizens of its Empire. They formed a unique community. There were tourists, businessmen, students and travelling entertainers as well as the many merchant seamen. The proportion of merchant seamen grew as more were captured at sea during the war. The huts were segregated by “race”, but the prisoners sometimes mingled. The younger Europeans became aware of different customs and one was taught Arabic from the Qur’an by an Arab seaman. Some inmates organised activities and quite enjoyed their experience. Salem Abuzed had a less happy time. He was released in January 1917 and got back to his lodgings in South Shields in April. He was interviewed by the Gazette, which took an interest in the internees and raised money for food parcels for them from its readers. Salem said that the Germans particularly ill-treated “coloured” seamen. When he refused to carry out a task that was against his religion he was beaten and then thrown into a cramped cage for 72 hours with only one slice of black bread a day to eat. Even after release back into the huts he was on the edge of starvation when parcels began to arrive from home. He still became ill and spent three months in hospital before he was released. Salem Abuzed made his home in South Shields, having received the Merchant Marine Medal at the end of the War. He opened his own boarding house. In 1935 he was a vocal opponent of the Council’s scheme to rehouse the Arabs in segregated blocks of flats. He told the Gazette, “I know what a camp is like. England is a free country and they cannot do things like this to us.” After much debate, the scheme as planned did not go ahead. Sources. The key work on the Yemeni community of South Shields is Richard I. Lawless, From Ta’izz to Tyneside (University of Exeter Press, 1995. ), which has a section on the First World War. The Commonwealth War Graves Commission records can be accessed on line. So can the cards which seamen filled in to apply for their Merchant Marine Medals. Hassan Abbas, Ahmed Naggi and Hamed Sulliman asked for their medals to be sent to South Shields. An identity card scheme, usually with a photograph, was instituted immediately after the War. These were used in an exhibition last year at South Shields Library, curated by Adam Bell, to create a database for seamen born in the town. Those of Arab seamen residents can also sometimes be tracked down, for example Ahmed Naggi, Hamed Sulliman and Ali Saleh. The Tynemouth World War One Project has documented the case of Joseph Crispin, born in Sierra Leone, whose last address was a lodging house in North Shields. He died after his ship was torpedoed off Scarborough in August 1918. Tyne and Wear Archives hold the papers from the trials of those charged following the South Shields “riot” in 1930. Among them were Ali Saleh, Thibuth Mahomed, Ali Annan, Said Sad and Mohammed Ahmed, Arab seamen who had sailed on merchant ships in the War. Their service records (all positive) were transcribed for evidence, showing the dangerous voyages they had undertaken. Such “books” were kept by the seamen themselves to show to the next captain and other examples may come to light.